Cameras on smartphones have transformed the way we take and share images, but they're still far from perfect. What about zoom? What about macro? Packed with algorithms and clever AI they might be, but what use is object recognition if the object in question is miles away? Despite the arrival of smartphones with multiple lenses, these fixed lenses aren't suited to every subject we point our smartphone at. You could reach for compact camera or DSLR, but given the connectivity and ease of use of your iPhone (or other smartphone), and the fact that you're more likely to have it with you most of the time, getting better results from your phone is preferable to lugging a camera around as well. The good news is that there are now a host of iPhone lens accessories that you can attach or connect to your device, whether you're using an iPhone XS or iPhone XR or an older model, enabling you to push your photographic skills even further, without losing the ability to easily upload and share your images. From affordable lens adaptors that convert the field of view of your iPhone's lens, to more advanced (and expensive) pieces of kit that not only have greatly improved lenses, but even their own built-in sensors to deliver better image quality, there's an option to suit any budget. When it comes to known brands dedicated only to making smartphone lenses, Olloclip is the last one standing. It makes a dizzying array of lenses, all of which ride on its new Connect X Lens System clip that slides on the top of an iPhone XR (a little cheaper than the XS Max version) and the XS (a little more expensive). It’s easy to use, but requires a case-less iPhone. This 60mm focal length telephoto lens has a robust, premium feel to it, making it a heavy option but with the advantage of being wider than the lens of most phone cameras, which helps to reduce vignetting and distortion around the edges of shots and amounts to better quality images overall. The included mounting plate easily attaches using a clean adhesive rather than a magnet, which can sometimes interfere with optical image stabilization. It also supports 25 different iOS and Android devices. Moment is now shipping plates for the iPhone 7 and iPhone 7 Plus, too. What's more, the attachment system avoids the need for a special phone case, which gives it a distinct advantage over many other lenses on the market. A nice microfiber lens bag is included that doubles up as a cleaning cloth. American firm Fellows has teamed up with renowned lens maker Zeiss to partner its ExoLens iPhone bracket with some high-end optics, and this wide-angle model reduces the iPhone camera's effective focal length to around 18mm. The entire casing is made out of black anodised aluminum, while the detachable lens is reassuringly weighty. Inside there are aspherical elements to combat distortion, and an antireflective coating to minimize reflections and improve light transmission. Quality is excellent, but the casing is a little cumbersome, and you're certainly paying a premium for the pleasure. If you have the iPhone, you probably think you have virtually the last word in photographic quality a smartphone can offer. Think again. 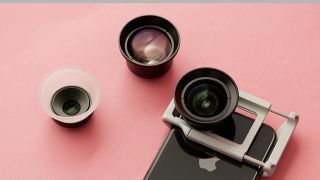 This all-in-one set includes three 'essential lenses' – fisheye, super-wide and macro – that ride on Olloclip's clip-on Connect X interchangeable lens system. It's all easy to use, though you do need to know about a workaround for the iPhone X's dual camera, which involves using portrait mode for close zooms. However, like most such clip-ons, it works with screen protectors, but not phone cases. It also blocks the flash. The CamKix for iPhone 6/6s is our entry-level pick for anyone exploring camera lens attachments for the first time. The kit comes with four lenses that offer plenty of variety, including a fish-eye lens and a combination macro/wide-angle lens. They may feel a bit plasticky, but shooting performance is surprisingly good for this price point, although don't go in expecting top-quality results or entirely distortion-free shots. The lenses screw into the included proprietary case. You even get a mini tripod with extendable legs, and a universal phone holder that offers a secure base to attach to the tripod socket. All in all, this is a decent gift set for the beginner. In essence, Sony has taken the guts from its WX150 compact camera and placed them in an even more compact body, save for the rear screen. The QX10 can be attached to your iPhone via an adaptor, or used on its own to capture shots from more unusual vantage points, connecting via Wi-Fi or NFC. Image quality is a noticeable jump up from that of an iPhone, while the 10x zoom offers much greater coverage compared to the lens in your iPhone. For those looking for even better image quality, check out the Sony QX100. If a clip-on lens is handy, so is one that works with any phone. The Nelomo is a kit of various lenses that each attach separately to a clip that fits over the top of any phone. There are three lenses – 0.65x super-wide angle lens, a 15x macro lens and an impressive 230° fisheye lens – which covers all the bases. The kit ships with a small case for storing all three lenses and the clip, and there's a carabiner to attach it to a belt that’s handy for out-in-the-field travel. If you're off on safari and you want to get close-up of The Big Five there are some space-saving alternatives to lugging around a DSLR and a telephoto lens. This machined metal iPhone adaptor snares whatever model of iPhone you choose (iPhone 6 upwards), and screws on to a PA Adaptor Ring affixed to a pair of high-power binoculars. The catch is that those binoculars (or spotting scope) must be made by Swarovski Optik, which makes some of the very finest (and most expensive) binoculars available. Just make sure you focus first with the binoculars before using your smartphone’s camera. With a fixed and fast 32mm f/1.8 combined with a large 1-inch 20.2MP sensor, there's plenty to like about DXO's One. Because it connects directly to an iPhone, there's no waiting about for a Wi-Fi connection and it won't lose the connection. The camera also fits almost seamlessly into the operating system, and images can be stored on your phone – plus there are raw files on the card if you want them for post-processing. That said, the One's connectivity is also a weakness. You have to remember to unlock your phone or go to the home page before you connect the One in order for the app to open correctly, and then there's a second or two delay before you can start shooting. The One produces great-quality images for a compact camera and it makes a fun, if expensive, iPhone accessory. Getting some magnification from a pocket-sized lens gets you only so far, so why not aim for the stars? This adaptor for any brand of phone puts the sensor directly over an eyepiece. That might sound rather manual, but that's really all it takes to take images with a phone through a telescope, and yet it’s something that’s almost impossible to do using a hand-held phone. However, there are some limitations. As well as the steadiness of the mount relying on the quality of your telescope as much as the mount itself, it's really only possible to take images of the moon. That's an incredible thing to do the first time, but the novelty may wear off.